What is Exercise Snacking? How it is different and potentially better than other exercise? What health & fitness goals is it suited to? Why might you choose to experiment with it? Exercise Snacking for Health & Fitness answers these questions. Read that first if you are new to Exercise Snacking. If you are convinced to give it a go and want guide on how jump to Exercise Snacking How To Guide. Quantified Self is the movement and practice of combining specific goals and methods of pursuing them with measurement to establish progress and the effectiveness of the methods. It is effectively a tool for citizen scientists to conduct N=1 experiments where the N is the number of subjects and the 1 is you! I applied a Quantified Self N=1 methodology to evaluate Exercise Snacking. I share that in full so that you can learn from and copy any part of the approach that appeals. Before experimenting with Exercise Snacking my weekly activity was already extensive. Thanks to that and a high quality diet I began from a baseline of being fairly fit, healthy and lean. If nothing else I was greatly interested in #1 and #2 as if I could maintain my general fitness in less time I could use the liberated time for other interests such as blogging! Goals #3, 4 and 5 were added to monitor whether Exercise Snacking had a negative, neutral or positive outcome. This Exercise Snack protocol required 30 minutes total per week compared to my existing 150 minutes of moderate intensity steady state. I planned to follow the protocol for 8 weeks to allow for a reasonable evaluation. I matched measurement solutions to each of my goals and established a baseline for each goal before beginning Exercise Snacking. I found the protocol very easy to follow. I was able to perform Exercise Snacks at work, at home and whilst travelling. Whilst at home I did make use of a kettlebell and dumbbells. Whilst travelling I could have taken a resistance band to enable more options. However even without any equipment at all I could still perform Exercise Snacks with ease. Protocol Notes: I already knew how much time I spent on exercise and getting to and from it. I used a very simple and free High Intensity Interval Training timer app available on Android to time my twice daily Snacks. Reflections: My ratio of time spent exercising vs time spent getting to and from exercise was already far better than most. At home I enjoy a small indoor exercise space, a garden, and a home gym. I live next to a park. At work I can very quickly perform air-squats and similar exercises in the restroom or visit a stairwell for stair climbing. My ‘magic’ power is being able to exercise intensely in most heats without breaking sweat so I had no need to shower after snacks. I simply took snacks wearing whatever I was wearing, including trousers and shirt, wherever I was. Caveat that warming up is strongly advised prior to vigorous exercise and I did not perform dedicated warm ups. Instead I began whatever I was doing a little more slowly and increased the pace. I felt comfortable doing so as a very experienced injury free exerciser. I recommend always warming up first. On the upside, if you would add in any form of travel time to a place of exercise plus the need to shower & change clothes the potential time saved would be far better than what I achieved. Protocol Notes: I used a very simple ‘Beep Test’ app available free for Android on Google Play. Once a week I marked out 20 meters on a nearby tennis court using chalk and performed a beep test as my first activity of the day, early AM. Reflections: Without a doubt I became ‘better’ at Beep Tests rather than necessarily becoming fitter. However the Beep Test improvement numbers were complimented by some less strictly controlled observations. The number of air-squats or jumps I could perform within 5 minutes improved. I noticed no reduction in my capacity or increase in perceived exertion during other activity such as resistance training, roller-blading and cycling. As far as I could tell my general fitness was maintained. Protocol Notes: My body weight and body composition were measured first thing in the AM after waking. I used simple and low cost ‘Renpho’ Body Composition Scales available from Amazon UK and Amazon US together with the matching app. These bio-impedence measurements do not offer accurate body fat measurements but I have found my scales very consistent and reliable. For months prior to Exercise Snacking my weight was within a 1 kilo (2lb) range and body fat within a 1% range. Because of this I trust that changes are meaningful even if the absolute numbers are junk. Reflections: Surprising. I did not expect any meaningful change and caveat that factors other than the direct exercise may explain the changes. After extended periods of steady state cardio I do typically feel hungry and eat a big meal. By contrast I noticed no impact on my appetite after Exercise Snacks. If anything, they suppressed appetite. Perhaps my net energy balance changed. Perhaps an overall reduction in exercise volume actually enabled improved recovery and muscle building. The result is encouraging & remarkable given that I significantly reduced my total exercising time. I bet that anyone beginning Exercise Snacks as a totally new and additional activity and who maintained their normal calorific intake could expect to see even better results. Weight control or reduction, body fat reduction and even some lean mass gains. Protocol Notes: HbA1C is a measure of ‘average’ blood sugar over weeks and months. It is an excellent indicator of insulin sensitivity (good) and insulin resistance (bad). 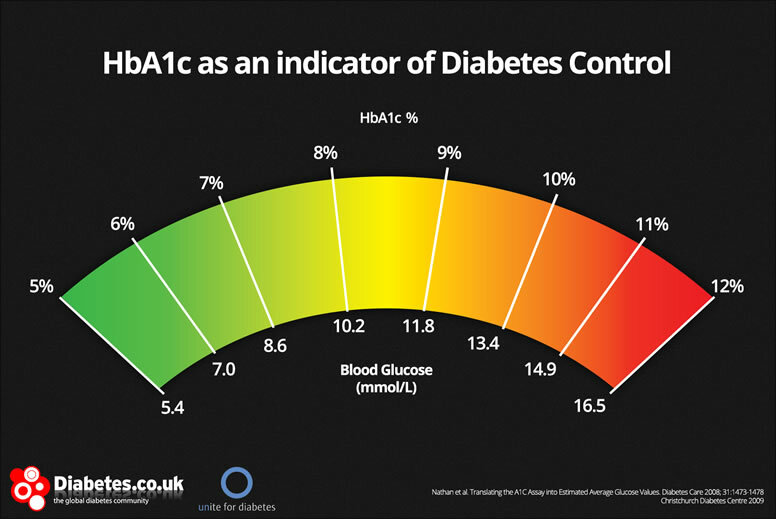 I have my HbA1C regularly tested every 4 months or so as part of a continuous monitoring approach of key general health metrics. I get this done via a test available direct to consumers in the UK, from Medichecks. There are similar services in the US and other Countries. Reflections: No change to my level of 33 nmol/mol, equivalent to 5.6 nmol/L or about 5.2%. This indicates an excellent level of insulin sensitivity. Given my baseline I really could not expect any improvement. There is plenty of research however indicating that Exercise Snacking has huge benefits for diabetics, pre-diabetics and blood glucose control generally. If that interests you jump over to my Exercise Snacking for Health & Fitness. I have some regret that I did not perform some personal tests to observe the impact on postprandial (after meal) blood glucose response. I expect that Exercise Snacking could result in a reduced peak or reduced time to return to baseline. Reducing the ‘area under the curve’ of the blood glucose response to a big meal would be a very welcome impact of Exercise Snacks. Again, there is evidence that Exercise Snacks can achieve exactly this within other test subjects. Protocol Notes: I measured my Heart Rate Variability (HRV) daily, first thing after waking and in a lying position. I used the EliteHRV app available on both Android and iOS together with the EliteHRV ‘CorSense’ HRV monitor. The monitor is an alternative to a chest strap and a first of its kind following a successful IndieGoGo campaign from EliteHRV. I previously used a Polar H10 Chest Strap and find the ‘CorSense’ far more convenient to use immediately on waking as it eliminates the need to get out of bed and dampen the electrodes on a Chest Strap. Within the same EliteHRV app I capture quick and simple notes on how I am feeling on waking and my sleep quality and sleep duration. This is literally just a case of hitting smiley buttons and adding notes if wanted. Reflections: A ‘feature’ of HRV as a outcome measure of well being is that it is impacted by everything and anything. One challenge this ‘feature’ presents is identifying cause and effect. If you begin measuring HRV it is a good idea to ignore the data for at least six months whilst you build a database of measures and accompanying notes. Otherwise the attempt to separate signal from noise will likely have you spotting tigers behind bushes that are really only being swayed by a gentle breeze. After 18 months of daily HRV testing I believe I have identified some definite causes and effects. My HRV is typically improved by socialising with friends, spending time outdoors, meditation, having my last meal several hours before bedtime and getting to bed early. My HRV is usually worsened by late nights, business travel and prolonged sedentary time, which tend to happen together! My 7-Day average HRV declined during the Exercise Snacking period. However this was a continuation of a decline that had already begun and continued after. I believe the root cause is increased work related stress from an unprecedented level of challenge and workload from a mega-project I have a key role within. I have shifted from feeling like an expert in control of my work and workload to feeling sometimes overwhelmed by complexity and pace. After performing Exercise Snacks in the PM using weights I did notice reduced energy levels both in the PM and following AM. However prior to Exercise Snacking I took all my exercise, excluding an evening cycle commute, first thing in the AM. My body is conditioned for exertion in the AM and inactivity in the PM and the Exercise Snacks presented a ‘shock’. I believe this is probably a good thing for overall conditioning and metabolic flexibility. I noted no differences in my sleep quality or duration. Both remained excellent. Maybe you need more evidence? If so there is plenty within Exercise Snacking for Health & Fitness together with very good reasons different to my own for Exercise Snacking. Convinced already? You could very literally begin Exercise Snacking today. It is quick and super simple to begin. Get started by reading Exercise Snacking How To Guide. Already Exercise Snacking? Tell me about it! Why? How? Need some suggestions? Ask me about it! Did you like this article? Great! Sign up to my mailing list or like or follow on Facebook, Twitter, Instagram or Pinterest for more. Please do comment or share too. I am intending to write more and more often about lifestyle and health. I am looking for the DIY fasting mimicking diet blog that I saw here months ago and again today, but now I can’t find it. How do I get back to that?